Tina's Crop Shop: Stampin' Up! World Card Making Day Blog Hop! Welcome to our World Card Making Day Blog Hop using current Stampin' Up!® Products. This is such a fantastic way to celebrate this event with lots of amazing inspiration for you. You are currently visiting my blog, Tina Riddle of Manchester, Tennessee in the United States, and you will be visiting lots of different places in your hop today. There is a list at the end of the page which will help you to move along from blog to blog so you can see all 20 of the amazing cards and projects! 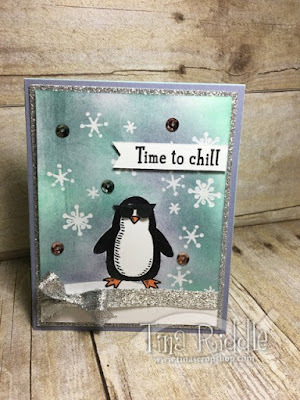 I used the Snow Place stamp set from the Annual Catalog to make this fun card. I started off with a 3 3/4" x 5" piece of Whisper White cardstock. I stamped the penguin in Basic Black Archival Ink and then stamped him again on a post it note and cut it out to form a mask. I made an additional mask for the snowy hill for my penguin to stand. I stamped the snowflakes in Versamark ink and then clear embossed them. I placed the mask on the penguin and on my hill and sponged in Wisteria Wonder and Pool Party. Once I was happy with my sponging, I removed the masks. I used a Stampin' Write Marker in Pumpkin Pie to color in the Penguin's beak and feet. I used some scraps of Basic Black cardstock to make Sunglasses for my Cool Penguin. I punched the little circles from the Owl Punch and hand cut a little thin black strip for the top of the glasses. I cut a small sliver off of the top of the two circles before attaching to the strip with Mini Glue Dots. I ended up cutting my little strip at an angle to make the glasses a bit cooler. The Time to Chill sentiment was stamped in Basic Black Archival Ink onto Whisper White cardstock. I used my Banner Triple Punch to punch the banner ends on it and attached it with Stampin' Dimensionals on the upper right. I ran of piece of the 3/8" Silver Glitter Ribbon onto the bottom and tied a bow on the left side. A few of the Fancy Frost Sequins with my Fine Trip Glue Pen. This layer was added to a 4" x 5 1/4" piece of Silver Glimmer Paper with Stampin' Dimensionals and then that was mounted on a 4 1/4" x 11" Wisteria Wonder Cardbase that was scored at 5 1/2". That was it, super easy and fun to create! Thanks so very much for stopping by! Happy World Card Making Day! You are at Tina Riddle's Blog so make sure you click the name after mine on the below list to continue on the hop! Enjoy!! Blessings, Tina!